Bistro Rx – eating my way through Charm City! Oh Bistro Rx, where do I start. They are cute and have an innovative menu – that can involve things like kangaroo. There is usually parking since they are not right on the square, but it is an easy walk from Canton or Fells. I’ve been for dinner a few times and find them a little over rated. Prices are a little high and the food and service is mediocre – generally most are satisfied, but is generally one person in my party who is a little disappointed. Despite this, I took the advice of a friend of mine who feels the same way about dinner, but raves about their brunch. My opinion might be starting to change – food is spot on and affordable. They serve local coffees from High Grounds, on the other side of the park. They also do bottomless mimosas, bloody’s, and screwdrivers by the pitcher. We didn’t go that route; I was much more interested in the coffee. My friends favorite and the most popular order at the table was the Katzenjammer Hash. They serve their crispy-outside, soft-inside potatoes in a skillet amongst a trio of pork products–scrapple, bacon, and sausage (it might be andouille)–which add a spicy kick to the whole dish. They must have a very special griddle back there and they have mastered crispy edges without overcooking anything. And if that isn’t enough they top that with two perfectly poached eggs and hollandaise sauce. The sausage and biscuits were also a hit – spicy sausage with a creamy gravy and their house made biscuits. 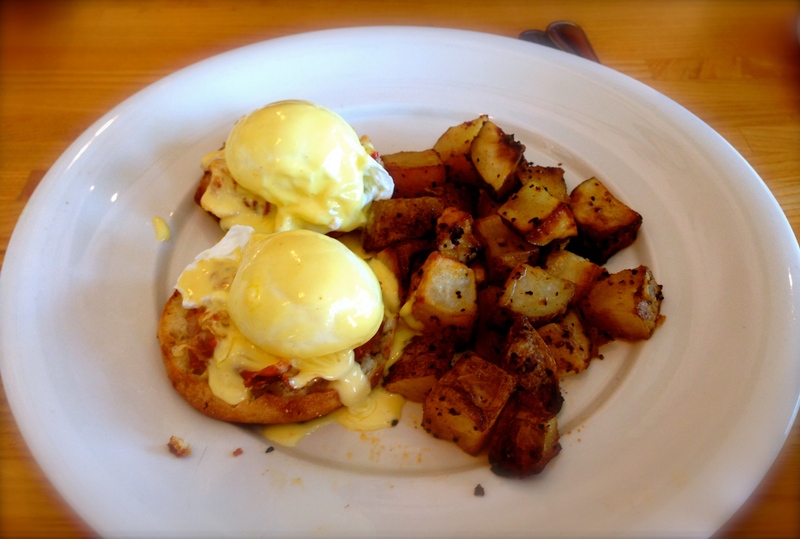 I went with my brunch staple – the Benedict A La Bistro. I liked these. The prosciutto was crispy and offered the perfect amount of saltiness for the creamy poached eggs and the hollandaise. Instead of smothering the potatoes, the eggs topped a buttery crusty muffin. I still got to try the potatoes; they were good, crunchy outsides and spiced with peppers and onions. I think the hollandaise could use a little more flavor and spice, but it was lemony and superbly creamy. Best part is they are starting brunch on Saturday. A fellow blogger has been for dinner and likes it a little more than me. * this post had a little help from friend Matt Baker. This entry was posted in All Good., Brunch, Canton, Charm City. Bookmark the permalink.